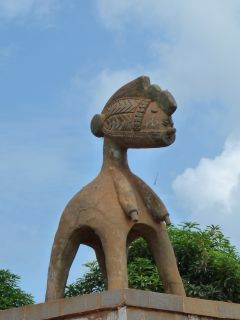 Archaeological findings in the Kakimbo grotto near Conakry and at Blandé prove that the area of today’s Guinea was already inhabited in the Neolithic era. Around 900 AD the Susu settle in Lower Guinea and the Malinké in Upper Guinea. The present-day Guinea, like neighbouring Mali is deeply marked by the history of the three great empires of Ghana, Mali and Songhay. Guinea was once the vasall of the great Ghana Empire, which was founded around 600 FD on the territory of the Soninké people. The wealthy rulers had their residence at Koumbi Saleh whose ruins can still be seen in what today is Mauretania. From their capital they controlled the Trans-Saharian trade and became rich especially by the trade in gold. By the beginning of the 11th century the Ghana Empire was at its pinnacle and reached from the Senegal River in the west to the banks of River Niger in the east. In the North its reached far into the Sahara desert. With the arrival of Muslim conquerors from Morocco the decline of the important empire started, from which it never recovered. In the 13th century the young king Soundiata Keita of the Mandé area laid the foundation of another great empire: Mali. During his reign the empire stretched from the Fouta Djalon Mountains in modern-day Guinea to the Inland Delta of the Niger river. His capital was Niani in the north of Upper Guinea. The most important and mighty ruler, however, was Mansa Moussa, who made his legendary haj to Mecca in 1324/25 when he distributed so much gold, that the gold price crashed and within 10 years only slowly recovered. During his reign the Mali Empire had its heyday and due to its numerous gold mines and the trade in salt and slaves boasted immense wealth. It stretched from the Atlantic Ocean in the west to the borders of today’s Nigeria. It was also a time of peace during which significant buildings were constructed and the arts were flourishing. The Mansa Moussa’s successors could not strengthen their power and by the beginning of the 15th century the decline of the great Mali Empire began. The vassal land of Songhay conquered Niani and burnt down the town. The Songhay ruler Sonni Ali Ber founded the Songhay Empire with its capital at Gao in the second half of the 15th century. After his death Askia Mohammed came to power and founded the Askia dynasty which ruled the empire for almost one century. In the 16th century the Songhay Empire was at the height of its power stretching from the Atlantic coast in the west to what is now Nigeria in the east. The golden period ended when the Moroccan army led by Ahmed el Mansur invaded the country and took over power in 1591. At the same time, while the Songhay Empire became powerful, the first Europeans reached the Atlantic coast. In 1473 the Portuguese sailed along the coast of Guinea in search for the sea route to India. They established the trade in gold, ivory and spices, their initial interest being limited to plain trade. However, when the Europeans started to need a cheap source of labour for their plantations in the Americas slave trade became a lucrative business in present-day Guinea. The African slave trade lasted several centuries and finally ended when Europeans colonised Africa in the 19th century. From the 17th century to the beginning of the 18th century Islamized Fula, originally inhabitants of the Niger Inland Delta and Fouta Toro in what is now Senegal migrated into the Fouta Djallon Highlands. They began to convert the indigenous inhabitants to Islam. In 1725 Ibrahima Moussa declared the Djihad (Holy War) and created a theocratic state led by Karamoko Alpha, who took the title Almamy. Internal struggles and disputes with the Toucouleur leader Oumar Tall facilitated the French advance, and in 1896 they began to colonise the area. Competition was fierce among the different European powers who were attempting to conquer the African west coast. The Portuguese occupied the area of present-day Guinea Bissau and the Cape Verde Islands. The English took control of Liberia, Sierra Leone and Gambia and the French annexed Guinea under the name of Rivières du Sud. In 1891 it was constituted as a French colony separate from Senegal, of which it had hitherto been a part. In 1893 it was renamed French Guinea, and two years later it became part of French West Africa. Resistance to the French rule emerged in 1882 when the Malinké leader Samory Touré put up an impressive effort to fight the invaders. He is still considered a national hero in Guinea. In 1998, however, he was defeated and captured by the French army. He was deported to Gabon and died there two years later. The country has become isolated internationally and engulfed in misery.In 1977 the Market Women's Revolt and following riots lead to a lessening of the state's role in the economy, and as a result Sékou Touré was willing tomitigate his dictatorial rule and approach France and the neighbouring countries. In 1984 Sékou Touré died of a heart attack. By this time his political partyhas little support and is immediately toppled in a military coup, led by Colonel Lansana Conté, a member of the Susu tribe, who became new president. He promised to respect human rights, fight against corruption and to restore the economy. But at the end of his rule Guinea had become the most corrupt country of Africa, the economy had broken down completely and protests against his politic were always put down in a violent way. Conté died on December 22, 2008 from a long leucemy. His death led to a military coup d’état led by Captain Moussa Dadis Camara. The junta seized power, and Camara became head of state. On December 3, 2009 he was shot and severely injured by one of his close Vertrauten. The number 2 of the military junta, Sékouba Konaté became head of an interim government and on November 7, 2010 democratic elections were held. Alpha Condé, Lansana Conté’s longstanding adversary won the elections and was sworn in president. Guinea has a population of about 10.2 million. The three major ethnic groups are the Fula also known as Fulani or Peulh in French, the Malinké and the Susu. The Fula are the largest group comprising 40% of the overall population. They migrated into Guinea from present-day Mali and live mostly in the Fouta Djallon Highlands. The second-largest group are the Malinké making up 30% of the total population. Most of them live in Upper Guinea. The Susu, who like the Malinké are part of the larger Mandé group, are concentrated primarily the coast. They form about 20% of the population. The remaining 10% are the inhabitants of Forest Guinea, consisting of a number of different ethnic groups, each with a distinctly different language and culture. 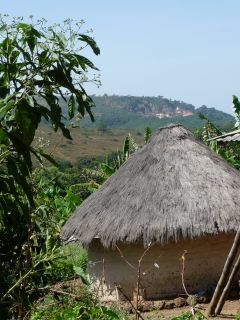 The Kissi have settled down around the town of Kissidougou. They are largest ethnic group of the forest region, comprising 8% of the overall population. 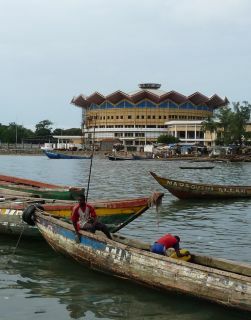 The Toma live around Macenta and N’zérékoré is home to the Guerzé. Other small tribal groups include the Baga around Kamsar, the Konianké, Kuranko, Manon and Kono, as well as the Bassari and Coniagui. About 85% of the overall population are Muslims, which is practised very moderately. 15% are animists and Christians. They are predominantly living in the Forest Region. There is little discord in the country and mixed families are common. French is the official language. There are a lot of local languages including Susu, which is spoken on the coast and in Guinea’s capital Conakry. Pular is the language of the Foula, who are mostly in the Fouta Djalon. Other languages spoken in Guinea include Malinké, Toma, Guerzé, Kissi and others. The savannah is dotted by baobab (Adansonia digitata), mango (Mangifera indica), karité (Vitellaria paradoxa) and nere (Parkia biglobosa).The red silk cotton tree (Bombax ceiba) is also found in the dry savannah. 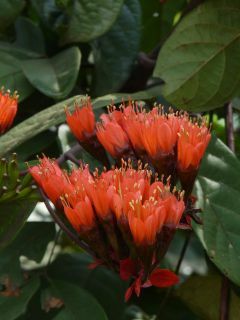 This tree is native to tropical Asia and has beautiful red to orange flowers, which appear when there are no leaves. The kapok or silk cotton tree (Ceiba pentandra) with its impressive buttress-roots and the flamboyant, which is native to Madagascar, are also common. 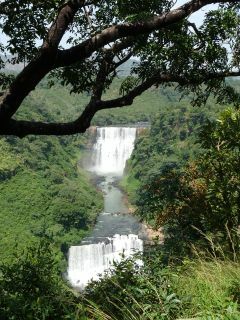 The Fouta Djallon Highlands around Dalaba are characterized by pine trees introduced by Auguste Chevalier and bamboo forests imported from China. Strawberries are grown in the area. Guinea’s climate permits the cultivation of a variety of crops including groundnut and potato. There are plenty of cashew nut trees and eucalyptus imported from Australia. Pandanus with mangrove-like stilt roots is commonly found along rivers and streams. Tree fern is rather uncommon. The coastal area is dominated by mangrove forests and palm groves. Large oil palm plantations line the roads as well as rice paddies, banana and pineapple plantations. The primary rainforest of Forest Guinea has almost completely disappeared. 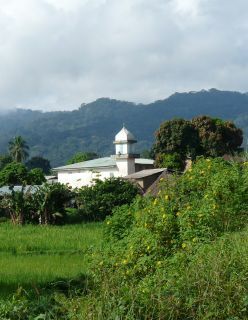 The area around Mount Nimba comprises primary and secondary forest. However, secondary forest is predominant. The Forêt Classé de Ziama is characterized by hard woods like Azobe and mahogany. An enormes Entandophragma cylindricum tree is considered the largest tree of this forest reserve. Much of Guinea’s wildlife is threatened by deforestation, poaching, overpopulation and converting land to agriculture. As a result, many species have been severely decimated in Togo orhave already become extinct. There are a few forest elephant in the area around Sérédou, some very few lions and leopards in the region of Faranah and north of Siguiri. The forests are home to different primate species like western chimpanzee, vervet monkey, patas monkey and baboon. Mount Nimba offers the best chances of seeing chimps. There are also some rare antelope species that inhabit the forested slopes of Mount Nimba. The Parc National du Haut Niger unfortunately suffers from neglect and a visit here can be disappointing. The re-introduction of chimpanzees and hippos to the Mafou Park situated between Faranah and Kankan is planned for the near future. In the north of the country close to the border with Senegal lies the Niokolo-Badiar Transnational Park. About 80 mammal species occur here, including lion and leopard, spotted hyena, different primate species like western chimpanzee, vervet monkey and patas monkey, as well as elephant, hippopotamus, African civet, genet and many more. A large number of reptile species occur in Guinea. Crocodiles are found in the rivers. A wide variety of snakes exists, including different species of cobra, black and green mamba and puff adder, but they are very shy and unlikely to be seen. Guinea is a country with great birding potential, 726 species occur here, including 9 endangered. Flamingos, pelicans and different heron species are found on the coast, in river estuaries and the mangrove swamps. The forests and the savannah are home to a large number of predators, including martial eagle, snake eagle and black kite. Different species of starling, weaver, hornbill, sunbird, kingfisher, roller and many others are common are easily sighted. Guinea has a total area of 245.855 square kilometres. The country stretches from the Atlantic Ocean in the west to Mali in the northeast and Ivory Coast in the southeast. In the north it is bordered by Senegal and Guinea-Bissau and in the south by Sierra Leone and Liberia. Guinea is divided into four distinct geographic regions: The coastal region also known as Lower Guinea is a low-lying coastal plain lined with estuaries, mangrove swamps and offshore islands. The Fouta Djallon Highlands also known as Central Guinea, reach an altitude of more than 1500m above sea-level. A number of important rivers have their origins in these highlands, including Africa’s third-largest river, the Niger River, as well as Senegal River and Gambia River. The northern savannah of Upper Guinea reaching heights between 400 and 500m is characterized by the Mandingo Plateau. Forest Guinea is a rain-forest region in the southeast of the country. It is home to Mount Nimba, Guinea’s highest peak at 1752m, declared a UNESCO World Heritage Site as a natural site. Although Guinea is richly endowed with natural resources and minerals it is still one of the poorest countries in the world. The widespread corruption and black economy make it difficult to improve the economic situation. Guinea’s economy is predominantly agricultural, with approximately 80% of its workers engaged in subsistence farming. The country’s principal agricultural products are millet, cassava, rice, potatoes, coffee, bananas and oil palms. Cattle raising and fishing are also important. Guinea’s primary mineral is bauxite, possessing the world’s second-largest deposits. Other resources are gold, diamonds, nickel, uranium, and iron ore. Alongside bauxite alumina, gold, diamonds, coffee and fish make the largest contribution to exports. Foodstuffs and consumer products are among the major imports.